Deus Ex: Mankind Divided brings you a new game mode called Breach. Here you are a Ripper - hacker - who wants to uncover the secrets of the mega-corporations. In Breach you fight for justice and the following tips will assist you in this. The Palisade Bank claims to have the most secure data in the world and all the data and secrets of their customers (Mega corporations) safely hide and protect. Rippers are hackers who want to penetrate bank in the systems of the palisade to bring the truth to light. Among other things, there are mysterious deaths, which have been commissioned and will be elucidated. Within the Breach mode it will conduct an avatar through which you interact with data and towers so the information downloaded from the servers (data extract) or fragments must collect. But even with Breach you're not sure, because here you stand against programmed guards who protect the secret data. It is not enough to steal the data, you must also manage to escape within a predetermined time. Once you have succeed in a breach in the enemy lines (to make a breach), you will be rewarded properly. Moreover, you can get your success with friends and compare your other players and try to be better and faster than the others. Once you start the game and decide for the Breach mode, you will be thrown into a sterile world and you explain what you actually do it here. Incredibly many more bounce on you and you have to read and read. Here you want just to see what is behind Breach. Since it may well happen that one or the other information is not perceived correctly. In the following, we have summarized the essential tips that you have encounter at the beginning of Breach and give you further information to help you with the new mode. 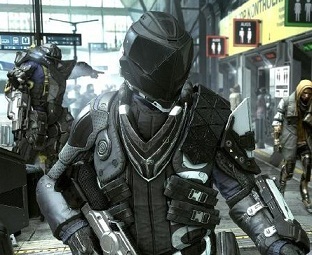 - There are several guards units, so to defeat or bypass them you need personal weapons, ammunition and augmentations. - You can also defeat some enemies without weapons, this option is called "knock out" and consumes energy that you have to recharge. However, these kills bring you extra points,. - Look thoroughly in each room. Sometimes you can also encounter walls that divide when you stand near or find hidden air ducts that bring you to the next section of the room. - Server blocks sometimes block your path, but they can also be useful if you want to move up. You can switch through server blocks in the ground - cracking the firewall, then they go up and bring you to the upper level. - To hack the firewall, you have to press the Action button in the dash on the compressed waves. Some server blocks are harder to hack and move faster. Here you need to press the button a little earlier. But beware! Each miss will be punished and the time is running out. - For completing the rooms you will be rewarded with credits and experience points. In addition, receive booster packs and in it are included weapons, ammunition and other useful items, which are stored in RESERVE. In LOADOUT you placed the weapons, ammunition and auxiliary objects which you want to use it in the game. On RESERVE you no longer have access after entering a room. This means that you must worry beforehand what you really need, because the place in LOADOUT is limited. - If you are getting the booster pack a practice kit, you should not invest those immediately in a new ability. Look at this in advance and given to what would suit your playing style. For some skills you need more practice points. - So that you can use these skills if you need energy. Therefore, it is always advisable to place biocells in LOADOUT. They serve to charge your energy bar again.